Technology allows participation Let’s start with a statement of the blindingly obvious and move quickly on. Technology allows for participation and interaction. It thus follows that creative ideas that wish to leverage technology must find ways of offering participation and interaction. Cue the rise of the participative idea. The problem is that there’s scant discussion of people’s actual buying behaviours in all this. For when it comes to participation, while much effort has gone into analyzing people’s digital behaviours, this zeal (and rhetoric) has not been matched by a desire to connect it to - or reconcile it with - an understanding of people’s actual buying behaviours. Participation inequality It’s well known that when it comes to people’s digital behaviours, not everyone wants to participate. And that not everyone wants to participate equally. Most of us will be familiar with the theory of Participation Inequality that states that in most online communities, 90% of users are lurkers who never contribute, 9% of users contribute a little, and 1% of users account for almost all the action. Sadly however, this theory would appear to be as unpopulated with empirical data as Pareto’s Law. And this has some significant implications for how we think about participation. A quick review of the data first. Most people don’t buy you very often It is often overlooked quite how infrequently people buy any given brand. Purchase frequencies - even in frequently bought categories - are not high. The analysis of Nielsen data provided by Professor John Dawes (2011) is revealing. For example, in 2007, Pantene was bought in the US at an average rate of 1.8 times a year. Fructis was bought at an average rate of 1.6 times a year, reflecting the so-called ‘double jeopardy effect’ in which brands with higher shares get slightly higher rates of loyalty. 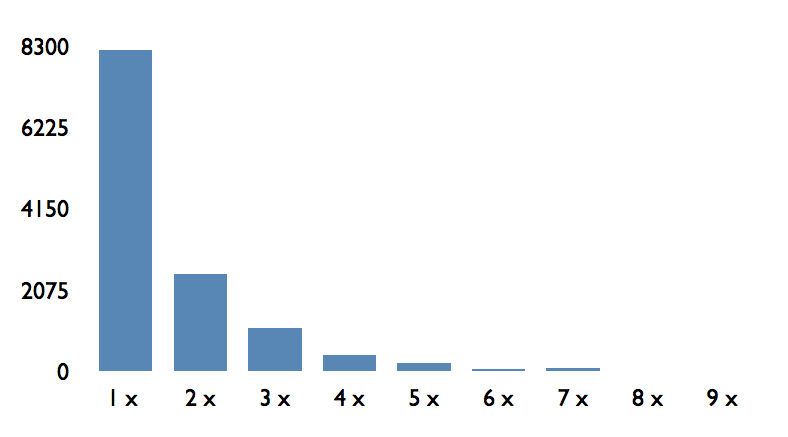 Irrespective of the category, the shape of any brand’s buying frequencies is a skewed distribution with a long tail. That is, a large number of people buy you occasionally, and an increasingly smaller number of people buy you more often. First identified by Andrew Ehrenberg it's known as a negative binomial distribution (NBD). Few consumers then, are devoted fans. Most people don't know your brand very well Brand knowledge - that is, the sum total of all perceptual associations held by people about the brand - doesn’t appear to be evenly distributed. 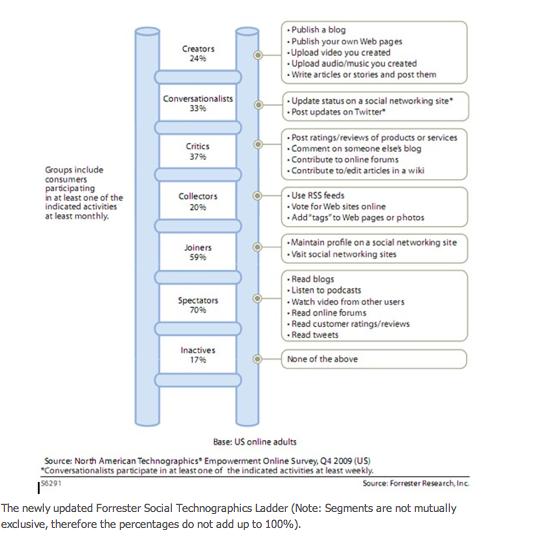 Sharp and Romanuik (2008) have looked at the composition of brand knowledge across populations of buyers, calculating the extent of this knowledge using data for 28 product categories and 208 brands. So it emerges that a few people know a lot about your brand. And a great many more people know something about your brand. Not surprisingly, this distribution reflects the shape of a brand’s user base. A few people buy you a lot. And a great many more people buy you occasionally. To grow in other, words, you need to recruit lots more new users who buy you just occasionally. Those light buyers, in other words, do matter. Trying to significantly to increase loyalty amongst a segment - to seek ‘loyalty beyond reason’ - is a fool’s errand. It would mean fighting the natural distribution for purchase frequencies for any brand. You can't beat the law of double jeopardy. The difference between big and small brands is not the amount of loyalty they enjoy, but the number of buyers they have - most of whom will be light buyers. 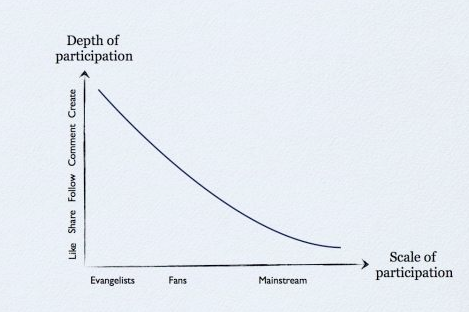 The participation paradox So where does this get us? It tells that a very small number of people buy us frequently, and know us very well. They’ll come into contact with our brand more often. They’ll be more likely to notice our advertising. And they’ll be more willing to participate in our marketing activity. Equally, it tells us that the vast majority of people don’t buy us exclusively, don’t buy us very often, and don’t know us very well. And it tells us that significant growth comes not from increasing loyalty but from attracting more people who don’t buy us at the moment. That is, people who don’t know very much about us, don’t have much contact with us, aren’t predisposed to notice our marketing content, aren’t inclined to participate in it, and won’t buy us very often. The battle is for interest, not attention Recognizing what kind of buyers growth must come from helps us understand that the real battle is not for attention, but interest. Brand growth is dependent on people who don’t care that much about us. For creativity of any form needs some form of resistance to ignite and inspire it, whether that’s the resistance of materials, media, form, genre or inherited expectations and practices. And so just as the engraver needs the resistance of the plate, we need the recognition that most people in the real world just aren’t that interested. This, not attention, is the real barrier to our success. And that’s a far, far bigger hurdle to conquer. It demands we find ways of being part of what people genuinely find interesting, rather than merely talk about ourselves. Fans are actors, not the audience The recognition that brands aren’t simply built upon exclusive loyalty but are highly dependent on vast numbers of light, polygamous buyers - and that growth comes from acquiring more of them, not increasingly the loyalty of current buyers - puts the role of the ‘fan’ into proper perspective. While every brand wants some, fans alone are not the lifeblood of a brand. They cannot be the focus of marketing communications if a brand is not to ignore the far bigger populations of buyers who don't currently purchase our brand. Brands need to reach out beyond their fans. That said, in reaching out to those who are more indifferent towards our brand, fans have another value, and that's their willingness (provided it's worth their while) to participate and share that with a broader audience. If we do it right, they can give us creative material, and they can give us access to their social networks. Participation isn’t enough Having a more clear-sighted view on people’s real world buying behaviours and thus which consumers actually matter to the generation of revenue and profit begins to gives us a framework for thinking about participation. Be realistic about how many will participate and how deeply - ultimately stimulating mass reaction matters more than chasing mass participation. Build for inequality - build into creative content both high friction and low friction forms of participation. A few people will want something (perhaps even a lot) to do, but many more will want a very little (or nothing at all) to do. Building in talk value into the idea itself is a more efficient way of achieving spread than buying it. Whatever the degree of participation sought, do something f*****g awesome that is genuinely worth talking about - seek to generate headlines, both amongst media owners, and in people’s social interactions. It’s got to be good enough for some to want to take part in, and good enough for others to care. Going beyond participation: An example The Nike Chalkbot/Livestrong campaign provides a good example of an idea with participation at its core - but which ensured that participation was amplified to a far wider audience. In September 2008, Lance Armstrong promised his return to professional cycling following his battle with cancer. He announced his mission to spread the message of Livestrong. Nike heard the call and responded with a campaign that would run during the upcoming Tour de France. The Chalkbot / Livestrong campaign ran from 26th June to 26th July 2009, starting a week before the Tour de France and ending on its final day. It was such a success it made a return to the tour in July 2010. The films ran throughout the Tour de France, and on the final night a primetime broadcast of Sportscenter was taken over. It was an hour-long celebration of the stories and people from the "It's About You" campaign. Over 64 million households tuned in that night. At the same time, the Just Do It brand spot, 'Driven,' was broadcast on all major networks. Inspired by Tour spectators who chalk the roads, Chalkbot was invented: a new social media tool that collected digital conversations and broadcast them into the physical world, using the road as the canvas. 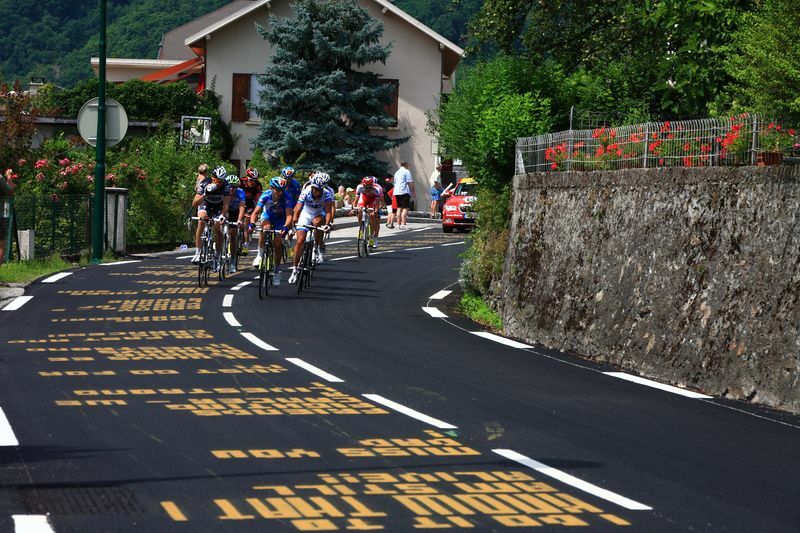 And over 13 stages of the Tour de France these messages were printed along the road. Chalkbot was seamlessly integrated into the TV coverage of the event, and commentators were briefed to talk about the Chalkbot. To reward those who'd taken part, participants were sent a GPS-tagged image of their message, as printed on the road. And on the last day of the Tour, the campaign culminated with a full-page colour ad in the Sunday New York Times. The ad showed Lance's determined face made up of various messages of hope from the Chalkbot. Obviously it would have spoken most powerfully and immediately to those for whom cancer was a very personal issue. And to those with a passion for cycling. But the marketing programme around the event ensured that its impact was felt far beyond these communities of interest. What matters most The purpose of marketing is not merely to secure the attention, participation and purchases of the fans alone. Brands depend on retaining and attracting legions of buyers who don’t know our brand well, and don’t buy it very often. Participation and interaction give us new and exciting creative material. But while participation can undoubtedly can bring our ideas to life in new, vivid, and exciting ways, the participation of a relatively small number of fans cannot be an end it itself. So while fans can be contributors to and and actors in participative ideas, ultimately this activity must find and interest the far bigger populations of buyers who have far less appetite to participate deeply but who are the lifeblood of brands. The rhetoric of ‘engagement’ has encouraged us to think in terms of depth. But reach still matters, and as the Chalkbot example shows, stimulating the emotions of big populations of people does not depend on their active participation. For ultimately mass reaction matters far more than participation.